We're happy to welcome our friend and new bass player Connor into the band, who comes from the Bay Area black metal underground, notably as the guitarist/vocalist of Dearth. James will move from bass to guitar so we are now a five piece/two guitar band. What will happen next is a mystery but an album will be born from it and its making has already begun. 2019 WEST COAST TOUR WITH HISSING. 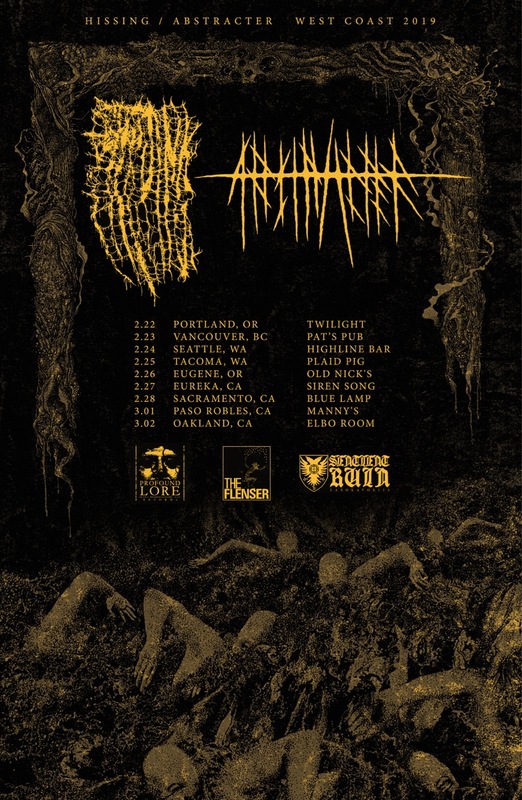 We’re hitting the Northern West Coast/Pacific Northwest in February and March 2019, all dates will be Seattle twisted black/death alchemists HISSING (Profound Lore Records). We're headed to Japan in November 2018. All dates will be with Tokyo-based nihilistic sludge lords Granule. We're scheduled to play on Saturday September 29 in Austin Texas at the second edition of this year's Red River Family Festival which is organized by Red River Family Records and will feature many black, doom, and experimental acts from across North America, including Dispirit, FIN, and Adzalaan, Imperial Triumphant, Uada and more - you can RSVP here white advance tickets are here. Last year's edition featured the likes of Volahn Krieg, Evangelist, and more. See you there. Cinereous Incarnate officially releases on June 8 2018. On June 9 we will have a dual record release show at the Golden Bull, right in downtown Oakland, with our friends Mortuous - also officially releasing their debut album Through Wilderness that same weekend. On the bill will also be our friends Petrification on tour from Portland OR, and Dipyus from Santa Cruz. You can RSVP on Facebook here. If you're local please come support the bands and pick up some merch. Everyone on the bill kills.